Iron Man has appeared in Marvel Comics since 1963 when he was created by Stan Lee, scriptwriter Larry Lieber, and designed by Don Heck and Jack Kirby; all of whom are responsible in one way or another for most of the dominant and ancillary characters in the Marvel Universe. Iron Man is the alter-ego of Tony Stark, a billionaire, and industrialist. Although the character was conceived as a response to the heightened tensions of the cold war, the ideas of a military-industrial complex still resonate to this day. Iron Man is responsible for the resurgence of the superhero genre and kicked off an incredible series of films that have grossed many billions of dollars. 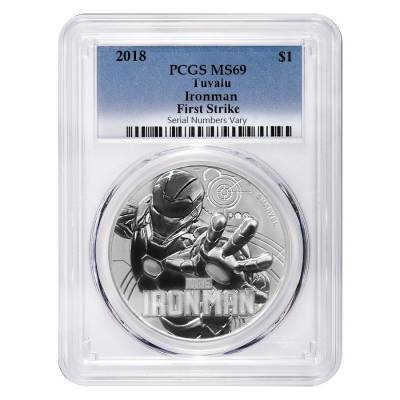 The obverse of the coin features Iron Man flying in the Mark 46 suit, and the reverse depicts Her Majesty Queen Elizabeth II designed by Ian Rank-Broadley. The coin is minted by the Perth Mint and has a face value of 1 dollar. 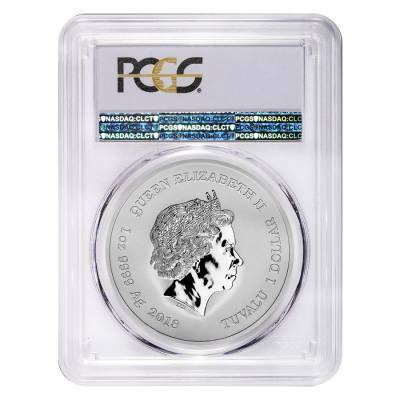 The coin is made of .9999 fine silver and weighs one troy ounce. It has a reeded edge. There is a limited mintage of 50,000 coins. The coin-grading and certifying company PCGS has authenticated this coin as MS 69 meaning it has an almost perfect strike. Made from .9999 fine silver, with a weight of 1 oz. At Bullion Exchanges, you will find the newest and most exclusive bullion coins of the highest quality. 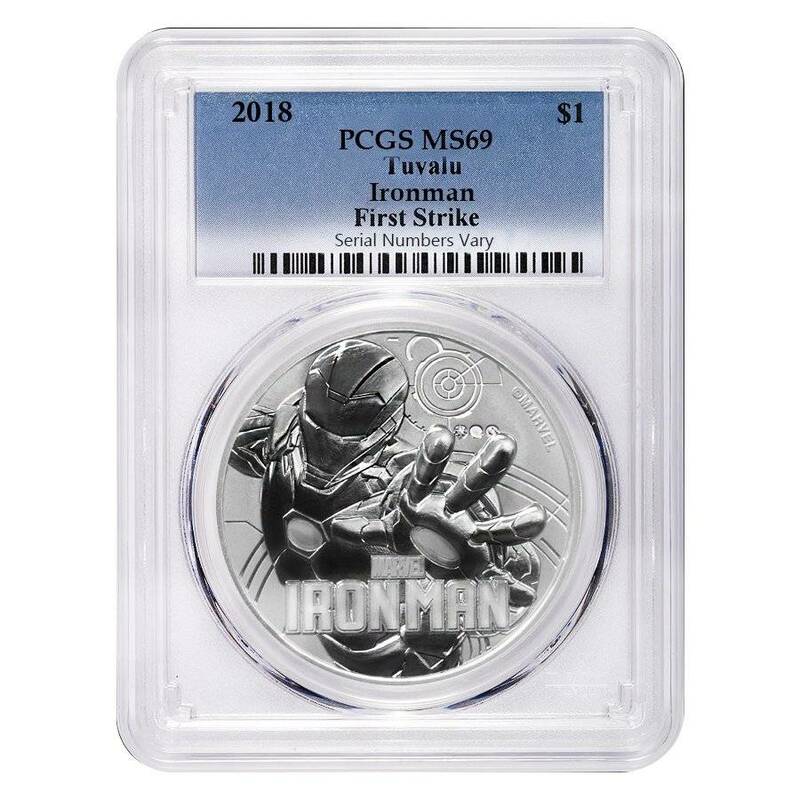 Order this exceptional coin and it will be carefully packaged and shipped to your address. For any questions, just call us at 800.852.6884, or send us a message, and our customer service representatives will happily assist you. Coins all came in beautiful condition not a scratch on one. Thanks BE for the great customer service as well! A total repeat of the fabulous service I have received in the past. Orders have always met or exceeded my expectations. Price and quality cannot be beat. Thank you for my past and future purchases. Love the spider man coins!! As usual Bullion exchanges treated my order with professionalism, courtesy, and accuracy. My order was shipped and received when they said it would be. Thank you very much! Very pleased with service. I have found BullEx to be an easy online environment to expand my coin collection. The Website is easy to navigate with a good search. The payment interface works well and your order is handled in a timely manner. All silver and gold products and prices are usually more than competitive. I give them 5 stars for good service. With this purchase, you earn 36 Bullionaire Bucks 36 BB = $0.04. We currently have 22 of this item in stock. For every $1 spend, you will earn 1 Bullionaire Buck which is equivalent to $0.001 off a future purchase. 36 BB = $0.04.